Are you having difficulty redirecting X11 to your Mac running Leopard without using ssh -X? Someone figured out that Leopard turns off listening to X11 traffic on TCP port 6000 by default. The following steps will TCP listening back on, so that the X11 server will service a client request. Now on your remote system things should be as before. Just setup your DISPLAY to point to the Mac and fire away. I assume this is persistent across a reboot, but I didn't try. The original solution was found here by Johannes Overmann. Failed <<<< >>> Could not execute auto check for display colors using command /usr/X11R6/bin/xdpyinfo. Check if the DISPLAY variable is set. Recently I started a new job with the added benefit that I have some new stuff to learn. Previously I managed EBS environments with a few standalone databases and I will be doing that here as well. Additionally they also use Oracle Portal, Oracle Internet Directory and standalone application server. I haven't used these before so I thought I would setup a vmware environment, install it and start plugging away. For the life of me, I couldn't find the install guide for the application server. After I wasted enough time looking I decided to uncompress the software and move forward anyways. It was then that I noticed the docs subfolder under Disk1, which containg an install guide. 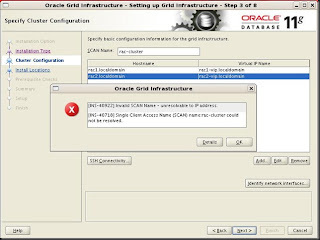 Getting INS-40922 Invalid SCAN Name - unresolvable to IP address, INS-40718 Single Client Access Name (SCAN) name: rac-cluster could not be resolved during installing Oracle 11g release 2 grid infrastructure installation. On production system the SCAN address should not be defined in the /etc/hosts file.